Are you looking for Skunk Removal in NJ? ALCO Animal & Pest Control offers prompt, professional and safe Skunk Removal in NJ since 1995 for many satisfied clients. Whether it is residential or commercial Skunk Removal , ALCO Animal & Pest Control will solve your Skunk problem in no time. Our trained and experienced Skunk Removal technicians are qualified to handle a variety of Skunk situations. ALCO Animal & Pest Control will keep you safe and keep you in line with state and local animal laws. ALCO Animal & Pest Control uses environmentally friendly Skunk Removal products as well as humane Skunk Removal methods to keep you and your children safe while performing the Skunk Removal job. Our knowledgeable pest technician will answer any questions you may have and explain to you every detail you need or want to know about the job. We are always friendly and we are here to help you get rid of Skunks. Skunks are mammals, usually with black-and-white fur. They come in 11 distinct sub-species. These animals are intelligent have very sensitive with temperaments with surprising variation found within each individual skunk. Skunks are similar to ferrets in that their curiosity can lead them into danger, especially if they crawl inside small areas or machinery. 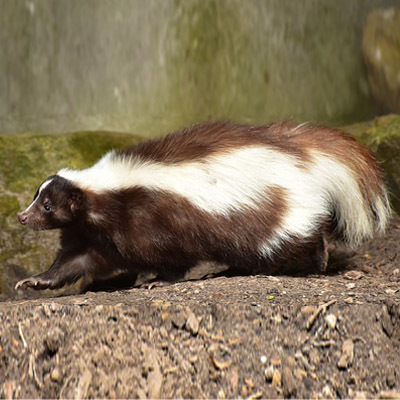 Skunks are reluctant to release their infamous stink, as they carry just enough of the chemical for five or six uses and require some ten days to produce another supply. Their bold black and white coloring, however, serves to make the appearance memorable so other species know to steer clear. Where practical, it is to the animal's advantage to simply warn a threatening creature off without expending scent: the black and white warning color aside, when threatened they will go through an elaborate routine of hisses and foot stamping and tail-high threat postures before resorting to the spray. Interestingly, they will not spray each other (with the exception of males in the mating season). While they fight over den space in autumn, they do so with tooth and claw. In case of a bite, follow medical precautions against rabies or other infection. ALCO Animal & Pest Control provides full removal and animal control in NJ. We are more than happy to inform New Jersey and out of state visitors about these and other species that can cause dangers to their health. We offer practical advice and solutions because we value the safety of animals in New Jersey and beyond.